Kelly and her mom move out of a house and into an apartment when her mom gets transferred after their divorce. Kelly struggles with the lifestyle in an apartment. She handles a confusing situation which shows her the advantages to living in an apartment. 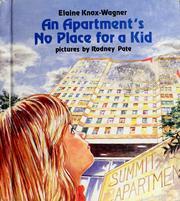 Knox-Wagner, Elaine, “An apartment's no place for a kid,” Children's Picture Book Database at Miami University, accessed April 22, 2019, https://dlp.lib.miamioh.edu/picturebook/items/show/8009.